I rely very heavily on the iOS Shortcuts app (formerly known as Workflows). So when the Shortcuts app would crash every time I tried to open it the last couple of days it was beyond frustrating. So I did some searching and found the answer and it turned out to be an incredibly easy fix. Rather than repeat everything here I will just point you to the source. The problem turned out to be a “bug” with how the Shortcuts app was syncing shortcuts with iCloud. Turning off the Shortcuts iCloud syncing and turning it back on again fixed the problem. Check out the iMore article for the step by step on how to fix this issue (thanks iMore!). I wanted to toss this article out there in case others had a similar issue because it was a very simple fix to what could have been a very expensive problem down the road if not quickly corrected. 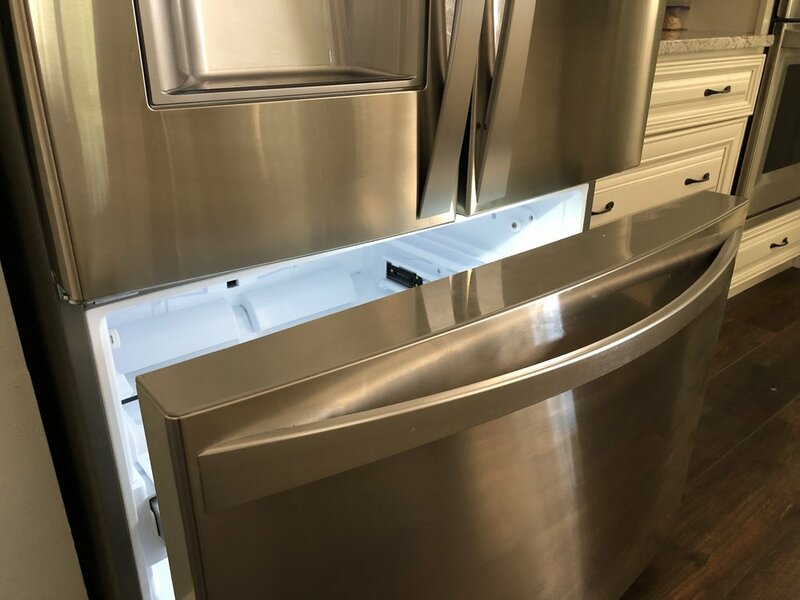 I woke up one morning and came downstairs to find that the bottom pull-out door to our refrigerator/freezer (the freezer section) had been left open. I shut the door after looking at the contents to make sure everything was still relatively cold and somewhat frozen (in case I had to throw anything out) and the fridge started making a pretty loud humming/grinding noise. Definitely not a normal noise we hear coming from our fridge (which is essentially silent running). The last two items I was not going to attempt to do anything with myself, but the first was a different story. As the fridge was cooling back down the freezer section I noticed a lot of ice that had built up on the surfaces of everything in the freezer. The door was left open long enough for warmer moister air to get into the freezer and the moisture condensed all over the surfaces. This meant that it was likely that moisture had condensed on the fan blades in the blower compartments and re-frozen. Just like on a prop plane, ice accumulation on blades/propellers is bad. It throws off the balance and makes the motor work a lot harder than it should (which could explain the noise I was hearing). So if there was ice on the fan blades of the blower unit in the freezer how I could I get the ice off? There didn’t seem to be any way to easily gain access to the blower unit and the fan blades. To make things worse there was also no way to just shut off the freezer part of the fridge...it was all or nothing. So what we ended up doing was moving all of the freezer items out of the fridge and into our deep freeze in the garage and then unplugged the entire fridge for a short period of time. Then we opened up the freezer door and put a small space heater in for about an hour to melt and dry out all the ice/water in the freezer section. After that was done we plugged the fridge back in and the fridge was operating just as quietly as it had before this whole open door incident happened. For reference, the fridge unit we have is a Kenmore Elite model 795.73153.610. I saved off an article to my Pocket account a few weeks ago and just happened to read it today. It was about a company called Slickwraps that makes “skins” you can stick directly to your electronic devices (phones, tablets, laptops) or their cases and add some protection and a lot of class. I’ve got a 12.0” iPad Pro with a SmartKeyboard case and I love it, but the case is just not all that pretty and attracts a lot of grime. So today as I reading my saved article about Slickwraps I noticed two things…they are running a 60% off sale this weekend (ends Monday March 18th) and they are based out of Wichita, Kansas (my hometown). So I just spent the last hour totally geeking out my iPad Pro SmartKeyboard case with Ready Player One artwork from The Art of Ready Player One book (I took photos with my iPhone of artwork from the book, cropped and edited the photos and used them for custom decorate a skin for my iPad Pro SmartKeyboard case). So if you want to customize one of your devices, check out Slickwraps this weekend while they are still running their 60% off sale! I came home from working over at our old house (trying to get it ready to go on the market) and I saw the news come across my feed...Apple was selling the iPhone SE on their clearance page online. I immediately told my wife who then dropped what she was doing and ran upstairs to get on the computer so she could purchase an iPhone SE. Her iPhone SE recently went out of warranty and it had been acting squirrelly for weeks. So she ordered her a new iPhone SE from Apple since this is the ONLY iPhone that actually fit in women’s pants pockets.